How ironic that after two posts about the water, I am literally surrounded by its effects. After a week of experiencing rain and flooding in Southern Alberta, I am thankful to be dry and safe. It’s the same feeling you have after paddling all day on a choppy lake and finally being able to wander on dry land amongst the trees. I love the land as much as I love the water, and can’t imagine a life without either. With the right canoe, a lot of skill, and a little bit of luck, you can navigate rapids. That’s not the case with waterfalls. 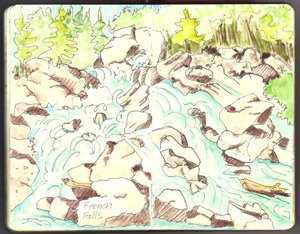 I read about kayakers who navigate falls in high water conditions. I cannot even imagine taking my canoe, or any kayak, down the falls. 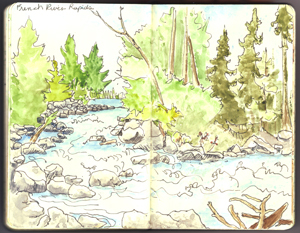 Instead, I choose to stay on land, portage the my gear around the fury, and find a nice rock to sit on and sketch. I conquer my falls with a pen, not a paddle. No sooner than I step off the boat and onto the land, I want to get back to the water. The French River may be a bit too ferocious for my little canoe, so I am happy to sit on the banks of the river, watching the rapids and thinking about how the Voyageurs must have negotiated this stretch of water and land. I am truly inspired by this historical setting. Whenever I paddle through the Canadian Shield, I am drawn to the trees. 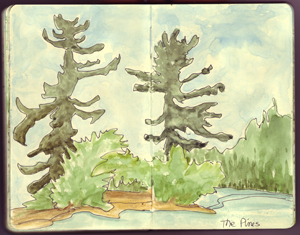 Wonderfully expressive pines watching over the lake. Every time I paddle by one of these guys, I want to stop and spend some time in their presence. I can’t get enough of them. 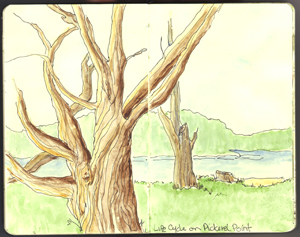 It’s no wonder that artists have been drawn to this land.